The visitor's center is open 9:00 A.M. to 9:00 P.M. and closed on Thanksgiving and Christmas. The center closes at 3:00 P.M. Thanksgiving Eve, Christmas Eve and New Year's Eve. You may contact the center at 402-453-9372. The Morman Trail Center participates in Florence Days in May and a Gingerbread Display between Thanksgiving and Christmas (or the end of the year), however, we do not have the details for these events for this year yet! In the year 1846, anything west of the Missouri River was known as "Indian country." When the Mormons arrived at the Missouri River (on the Iowa side), the U.S. government made arrangements with the Indian nations to allow the Mormons to camp on the western side of the Missouri River for two years. This area became known as "Winter Quarters." 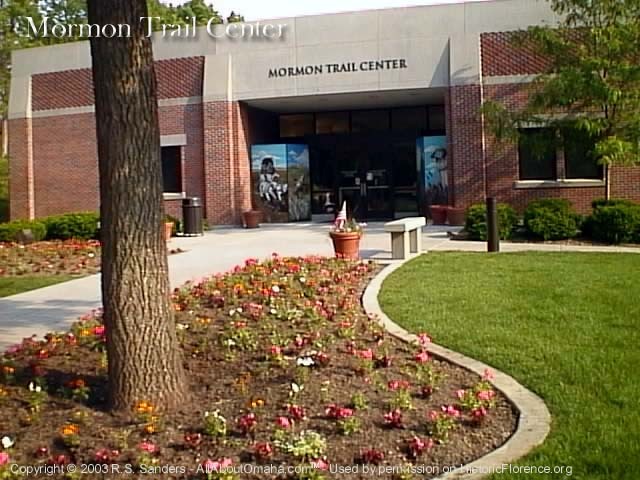 Today, you can visit the Mormon Trail Center at 3215 State St, a monument to the trials and tribulations of the early pioneers. In a free guided tour, you can see an example of a primitive log cabin, ox drawn covered wagon, hand-carts, and many other artifacts of the era. A guided tour starts with a short film that helps tell the story in a way that you cannot forget. The Mormon Trail Center, opened in April 1997, has been providing tours of the local area history ever since. Near the front entrance is the large brass sculpture showing the Handcart Pioneers. You can use the image on this page to see a larger version of the handcart pioneer sculpture. The cemetery across the street is a tour in itself. Most of the graves are from the Winter Quarters era, however, the cemetery was also used by the early settlers of Florence. * Directly across the street (at the north end of the cemetery) is the large bronze sculpture by Avard Fairbanks of a couple burying their infant child. The latest addition is the Winter Quarter Temple that opened in April of 2001. Over 61,000 people visited the new temple from April 2nd to the 14th (of 2001).